Located southeast of the Bitterroot Valley, Big Hole National Battlefield is the site of the turbulent 1877 conflict between the fleeing Nez Perce tribe and the United States army. Big Hole Battlefield is located southeast of the Bitterroot Valley. See where the Nez Perce tribe of 1877 met with the US army resulting in a devastating conflict. Open daily from 9 am – 5 pm in summer/autumn and 10 am – 5 pm in winter/spring. On the morning of August 9, 1877, US soldiers opened fire on a camp of Nez Perce as the tribe rested near the North Fork of the Big Hole River on their long journey toward freedom. By the time fighting was finished, more than 90 Nez Perce and 31 soldiers had perished. Big Hole National Battlefield is one stop along the 1,100-mile Nez Perce Trail. Battlefield visitors can learn about the tribe’s historic flight during the summer of 1877 as well as experience the Big Hole conflict by touring the battlegrounds, listening to speakers, watching films, and viewing artifacts. Summertime activities include a demonstration of tipi construction, a speaker series, guided walks and more. Located near the Big Hole River and National Forest land, nearby activities also include fishing, hiking, hunting and sightseeing. Big Hole Visitor Center is currently closed for renovations however a temporary visitor center is open. Big Hole National Battlefield is located on MT-43, 10 miles west of Wisdom, Montana and 70 miles south of Hamilton, Montana. From the Bitterroot Valley, travel south on US-93 until you reach Lost Trail Pass. Turn east onto MT-43 and continue 17 miles to the battlefield. 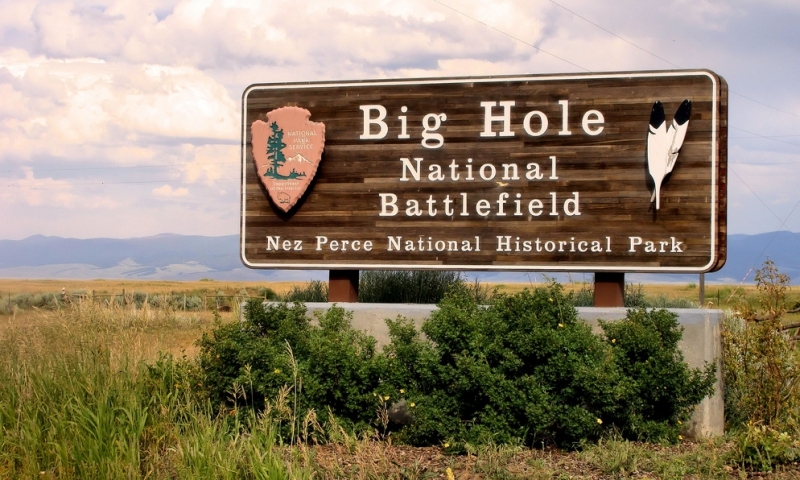 There is no fee to visit Big Hole Battlefield. Educational groups and bus tour groups are encouraged to make a reservation prior to visiting. Call: (406) 689-3155. Each year, Nez Perce tribal leaders and members travel to Big Hole Battlefield to honor those who perished in the conflict. During their visit, commemoration programs are held that include a pipe ceremony, traditional drum circle, and more. These events are free and open to the public however photography and filming are not allowed during the ceremonies. Call the battlefield for commemoration schedules.